I had a weekend trip to the coast for a college friends reunion. We had clouds and daily rain showers, but also sun, rainbows, and ospreys nesting just in front of the house. Lots of fun reconnecting with these smart, witty women and remembering what it was like to be eighteen—good stories, some uncontrollable giggles. On our last morning together we managed to practice yoga and meditate outdoors under a blue sky. Back home in Chapel Hill the garden is in need of a good soaking. A half-dozen gladiolas opened while I was away so I tried to create a mixed arrangement using them along with some sweet peas and zinnias. Zinnias are producing more and more blooms. They tolerate heat and lack of water, though even they seem tired of this dry spell. Gladiola are awkward in such a social setting, so I ended up letting them rest on the sideline. A patchwork quilt of zinnias moved into the spotlight. 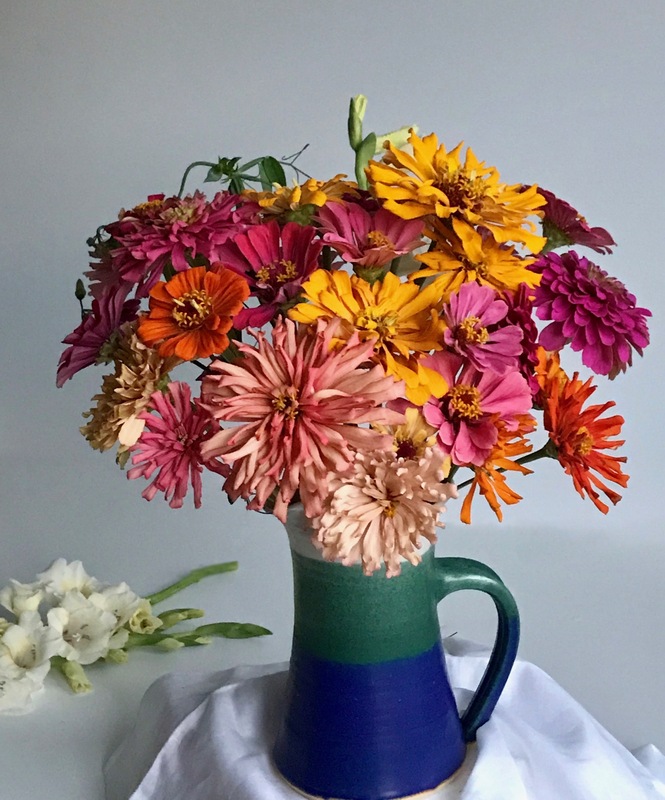 This entry was posted in garden and tagged 2017vase, flower arranging, flower design, gladiolus, in a vase on monday, nature photography, Zinnia ‘Cut and Come Again Mix’, Zinnia elegans ’Cactus Flower Blend’ on August 7, 2017 by pbmgarden. Very different from your usual arrangements but lovely all the same. Aren’t Zinnias so rewarding? 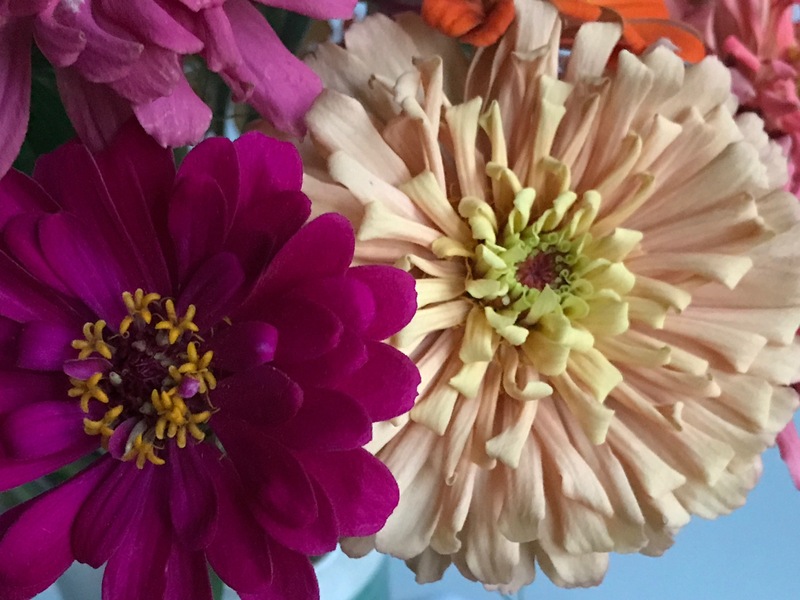 Thank goodness for Zinnias — they carry my garden through the summer like nothing else. Yes, here too. They flower from the end of June until we get a frost. My sister is the quilter in the family, but I have fond childhood memories of snuggling under a patchwork quilt made by my grandmother and being amazed those scraps of fabric carried the history of clothes worn by people long ago. Gorgeous zinnias, especially that little copper orange one. Sadly a flower I shall never be able to grow while I stay living in Scotland. But I am content to admire yours! After reading about your recent weather I understand your comment. Will be happy to keep sharing these zinnias. They make me smile every time I pass by today’s vase in the kitchen. I am really enjoying the cactus flowered zinnias here, although thinking about it I haven’t had a bloom for a couple of weeks…must investigate. Even though I am not a great fan of mixed colours, it seems to work better for zinnias somehow. Yours are gorgeous and I would have misse the gladioli if you hadn’t mentioned them! Love this jug and haven’t we seen a few vases from this pottery from you? Glad you’re enjoying the cactus zinnias. I usually prefer a limited palette also but summer flowers have such a varied range it’s nice to opt for excess. Oh and yes this pitcher has held lots of Monday blooms. A wedding gift. Zinnias have come a long way! I keep thinking they are Dahlias which I am not really have great luck with. 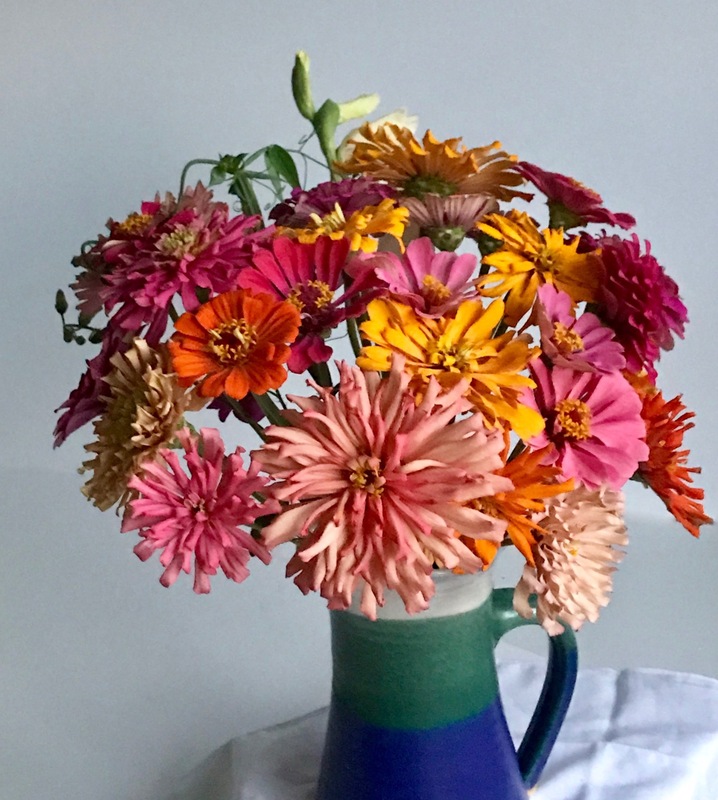 Zinnias would be much easier and I would be more likely to cut them for a beautiful vase like yours today. Really have to think about them for the future. I don’t have much luck with Dahlias either but keep seeing interesting colors and varieties that make me want to try them. Zinnias do have a similar character and are pretty easy. Those zinnias are just perfect….congratulations to the gardener. Thank you Noelle. The zinnias are delightfully reliable. It does seem that the Zinnias took over (they do that so easily!) but those white Gladiolas you captured in your first photo look lovely simply lying unadorned on the counter. Your weekend reconnection with old friends sounds just wonderful. I had used glads last week so didn’t feel like arguing with the zinnias this week. The glads are just lovely up close. Didn’t have time to work further with them though so just stuck them in a glass. They’re happy. The friends weekend was great fun. Bold, brilliant colours and they looks so good bunched together in the jug. I’m sure the gladioli look great on their own. Thanks Alison. The pitcher seems the appropriate choice when there’s an abundance of zinnias. It is always fun to see these college friends. Always thought I’d like to design quilts but not actually do the sewing. Beautiful, looks like a Dutch painting. Simple pleasures, like seeing old friends! Thanks, I feel the same way with lots of plants in my garden. You made a beautiful arrangement. The colors! Even thought their annuals, Zinnias are energizer bunnies of the garden….they keep going and going and going. I love your pitcher. Hi Sally, thanks for commenting. Zinnias are sometimes seen as too common or ordinary but I have always had them in my garden. They last for days and days as cut flowers. The pitcher was a wedding gift (we just celebrated 40 years this summer). Cathy, those creamy colors are my favorites too. They almost are overshadowed by the brighter colors but they’re very rich on their own. I should try to save seeds from them. Hi Malc. Those zinnias brighten my day. Love those colours! Zinnias are great flowers! Hi Anca, yes zinnias carry my garden through the hottest part of summer with their bright colors. Great title, Susie. Your vase reminds me of those crocheted granny patch quilts. Zinnias are such a cheerful summer flower! My Zinnias never materialized so thanks for sharing yours. Oh that’s too bad Ricki. Well happy to share these. You may get tired of seeing them though. Not much else in the pipeline. Love the Zinnias, and the mix of colors. Thanks Jason. The zinnias are about the only thing going right now.